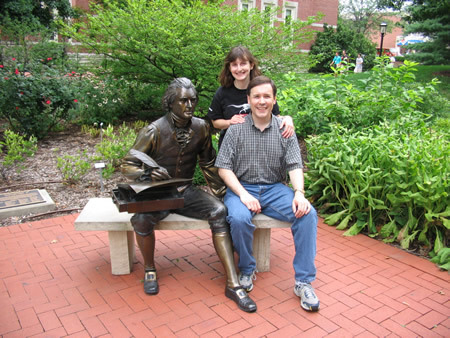 This is the fourth post in a series of our trip to Columbia Missouri. To read what Padre, Panda Bear, and Meerkat were up to in our absence, check out the Furry Bambinos blog. Given all the stress of driving on Wednesday, we were very happy to sleep in on Thursday morning! We had very comfy beds at the Hampton Inn, and ate a nice breakfast down in the lobby. Around 11:00, Patty called to say that she and Chris were coming to pick us up for a day of sightseeing around Columbia, Missouri. 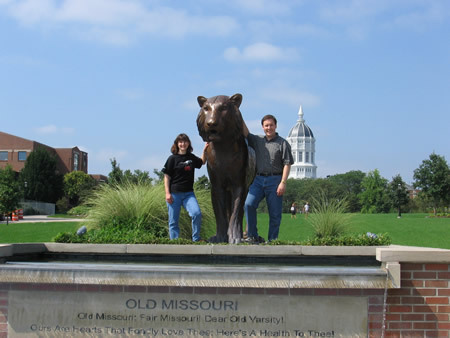 The main destination on the agenda was the University of Missouri , which is where Chris’s job will begin at the end of August, and where Patty will be going to school for another Masters degree. Chris drove us down Broadway, one of the main roads in and out of the downtown. First, we walked around downtown seeing some of the sights. 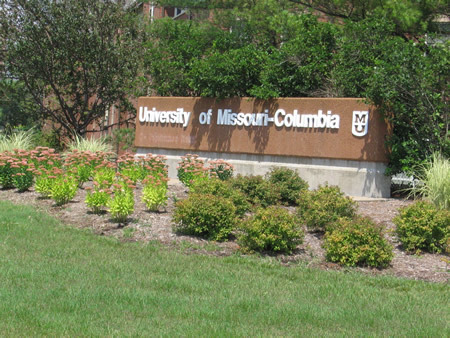 Columbia, Missouri , is located on the southern side of Interstate 70, about half-way across the state of Missouri, midway between St. Louis on the Eastern edge and Kansas City on the Western edge. Overall, Columbia is not a very big city at all. No towering skyscrapers like in Pittsburgh. No public transportation. It consists of a fairly small downtown area and LOTS of suburban housing in the surrounding area. 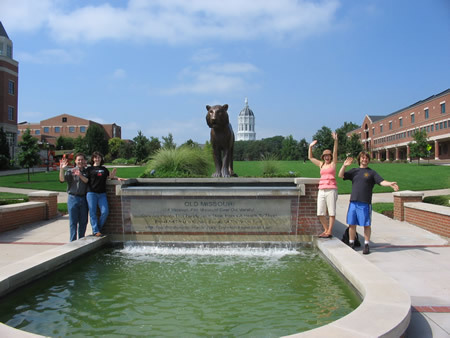 The biggest attraction and employer is the University of Missouri, but there are plenty of other things to see and do. 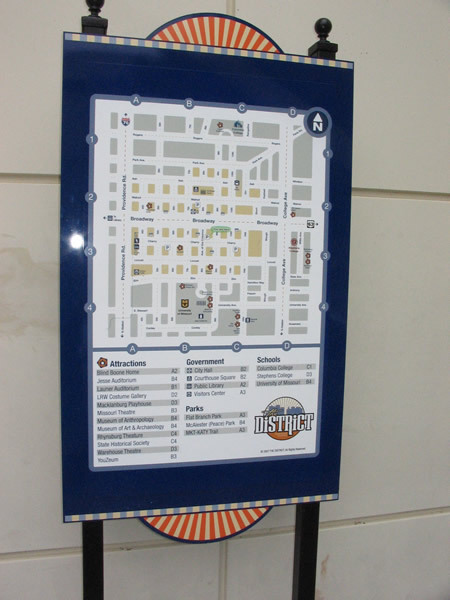 This map is the main shopping district area where we spent most of our time. After arriving in downtown, we ate lunch and made our way over to the University of Missouri . The University is on the southern edge of Columbia, just a few blocks from the center of downtown, but we drove the distance anyway and parked on campus. Our first stop was Townsend Hall. This is the building that houses the Department of Education, which is where Patty has her Fellowship and where she will be studying early childhood education. There’s a giant library within Townsend Hall, so we decided to stop and see the sights while Patty gave us a little tour. 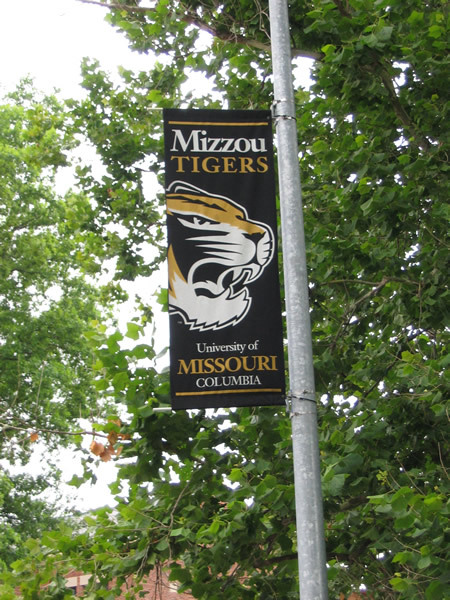 The University of Missouri, also known as “Mizzou”, is a Big 12 school in the Midwest. The mascot is a tiger. The tiger is EVERYWHERE. 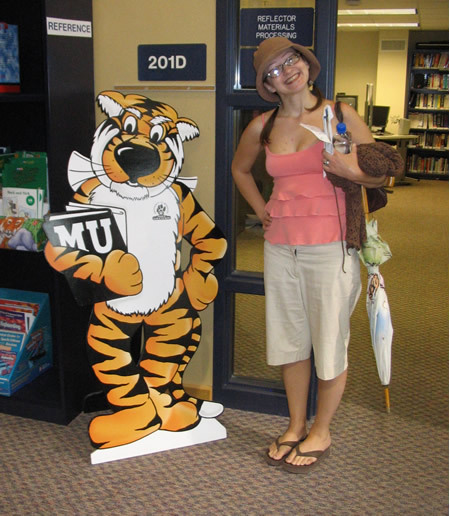 Here’s Patty posing with the scholastic version of the tiger. 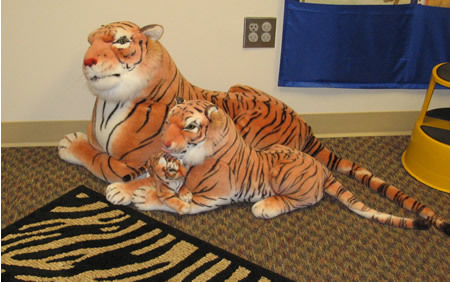 There were stuffed tigers to be found around the library. This little family of tigers was in the children’s playroom area. 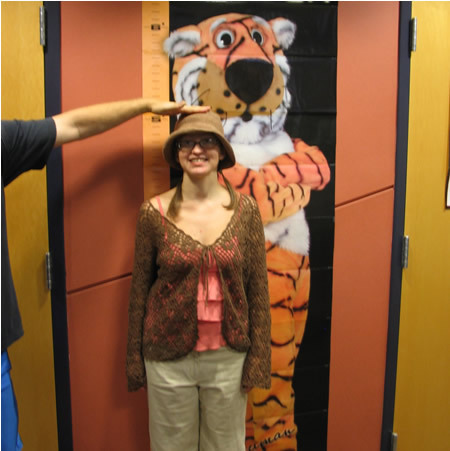 There was even a poster to measure your height against the tiger. That’s Chris’s arm marking Patty at just over 5 feet tall. 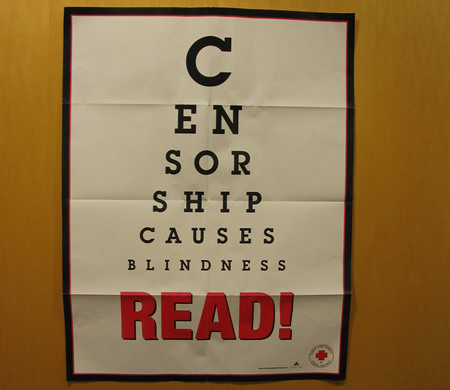 This was a cool poster in the library! 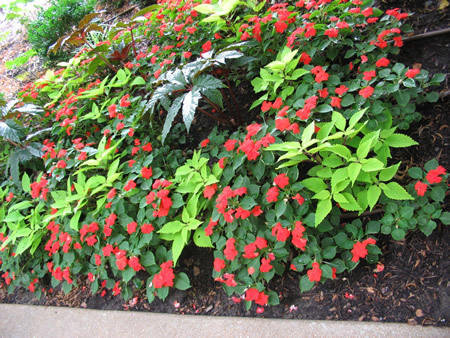 The campus grounds of Mizzou are a certified botanical garden. The flora and fauna were in full bloom and absolutely stunning. 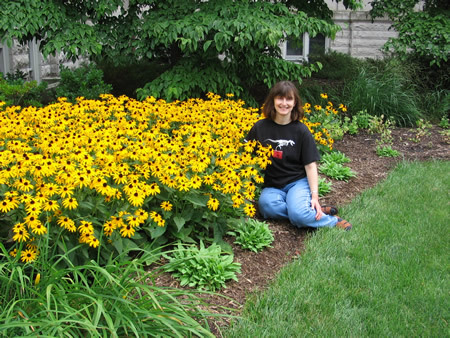 Here’s Susan with the Susans. The most famous landmark on the campus is this row of six stone pillars. They are the sole remnants of a fire that destroyed the original campus administration building in 1892. They are at the main northern entrance to the campus, and a luscious green lawn surrounds the area. Apparently a lot of campus events happen on the lawns around these columns. In the background of this photo is the administration building built in the early 1900’s that replaced the one that burned down. The “new” building is called Jessup Hall. This photo looks south onto the campus. 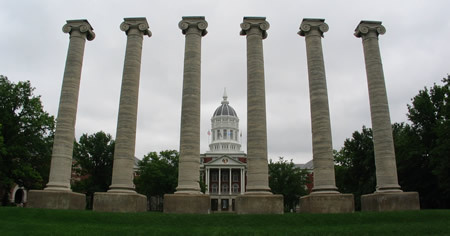 The University of Missouri was the first state university on the land purchased by President Thomas Jefferson in the famous “Louisiana Territory”. 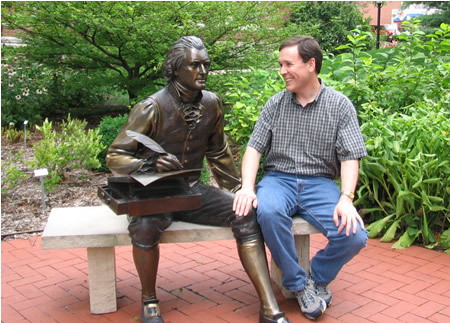 Consequently, the campus has a life-size statue of TJ to sit with. Here’s me getting a little fresh with Tom! Another significant point of interest on the campus is Thomas Jefferson’s original gravestone. Jefferson died on July 4, 1826, on the same day as John Adams, 50 years to the day after the wording of the Declaration of Independence was adopted. This original gravestone was a gift from the Jefferson family heirs to the University on July 4, 1883 (57 years after TJ’s death). It was moved from Jefferson’s Monticello home to commemorate Jefferson’s contributions to the westward expansion of the United States, his commitment to public education, and to commemorate the first state university in the Louisiana Territory. A replica copy of this gravestone is at Monticello in Virginia. 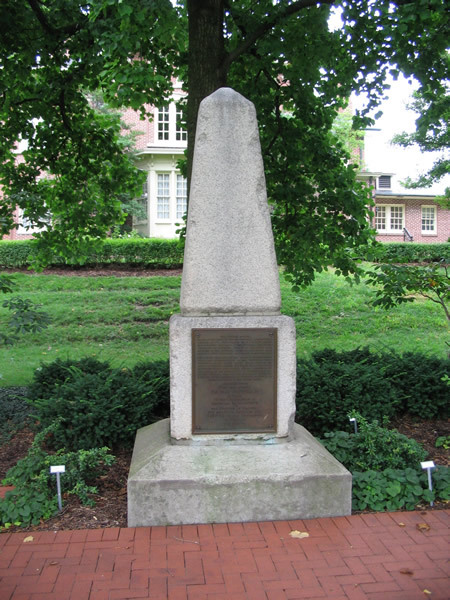 The gravestone obelisk was officially dedicated during commencement exercises on June 4, 1885. We continued on around the campus, taking in the sights, heading toward the campus bookstore. As I said, tigers are everywhere! We loaded up on Mizzou merchandise at the bookstore, and Chris got his computer activated to work on the campus wireless network. Fortunately for the Pittsburgh Steelers fans amongst us, the colors of the school are … black and gold! We got Mizzou shirts to wear. After leaving the bookstore, we eventually made it to this fountain on the southern edge of the campus. Next to the tiger in this photo is the top of Jessup Hall, the administration building. The six columns you saw earlier are on the other side of Jessup Hall. 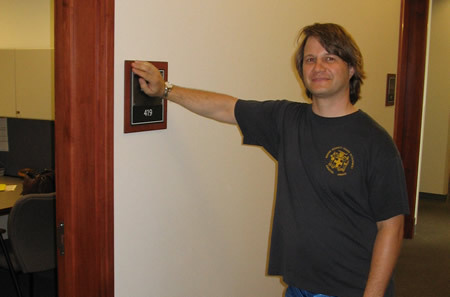 Next stop was the building where Chris will be working! 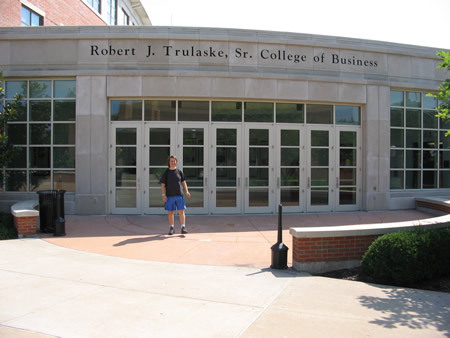 Chris will be a professor in the University of Missouri College of Business. This building is a relatively new one on campus and features a giant seminar room with a raked floor like a big theater, plus a lovely atrium several stories high. Um, yeah, he’s looking so casual here because someone else’s name is still on the placard! So that was our grand tour of the University of Missouri ! Fortunately, Chris knew where best to park, because when we left the building, we simply crossed the street and walked into the parking garage! Patty said we should make sure to stop at the house and give Bruiser a walk. So we drove past the campus football stadium back to Chris and Patty’s house to see the house in the daylight, take pictures and freshen up for dinner. We’ll post the “house tour” tomorrow! Stay tuned! 2008 Missouri Trip: Day Three: From Dayton to Columbia 2008 Missouri Trip: Day Four, Part 2: Chris & Patty’s House!